Coooome aaaaaand get it! No takers? Thanks to Haiku Heights for hosting The September Heights, a haiku-a-day challenge with a daily word prompt, the final of which was “free”–appropriate for ending our month-long venture. Some days were tougher than others! Thanks to all the participants, readers, likers, and commenters. What a supportive group! I’ve learned a lot from you, and even if I didn’t always have time to comment, I have done my darnedest to read every single haiku. Haiku Heights is hosting The September Heights, a haiku-a-day challenge with a daily word prompt to be used as a theme and/or in the haiku. Today’s prompt is “battlefield.” Click through to check out more haiku or to add your own. The reference for those who are interested! Haiku Heights is hosting The September Heights, a haiku-a-day challenge with a daily word prompt to be used as a theme and/or in the haiku. Today’s prompt is “waltz.” Click through to check out more haiku or to add your own. Haiku Heights is hosting The September Heights, a haiku-a-day challenge with a daily word prompt to be used as a theme and/or in the haiku. Today’s prompt is “footprint.” Click through to check out more haiku or to add your own. Haiku Heights is hosting The September Heights, a haiku-a-day challenge with a daily word prompt to be used as a theme and/or in the haiku. Today’s prompt is “paper boat.” Click through to check out more haiku or to add your own. 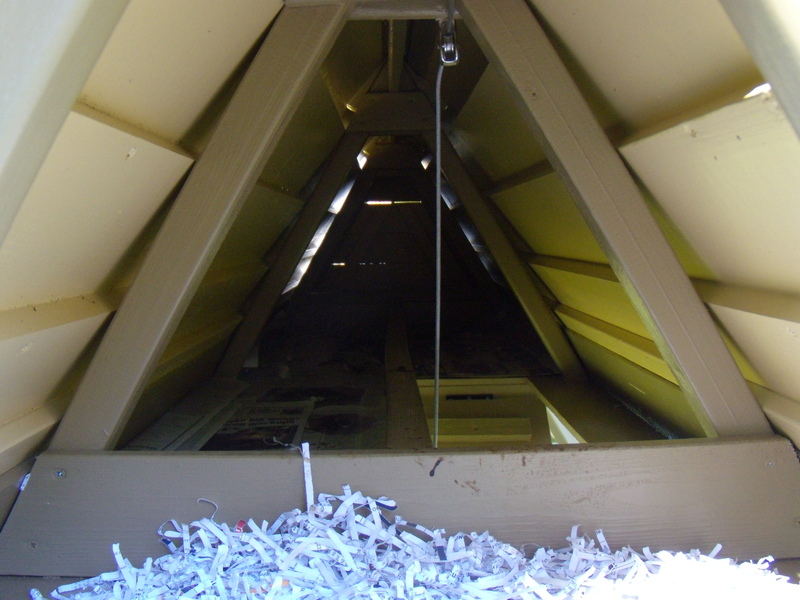 Looking through the egg door to the nest box (where the shredded paper is) and the roost (the pole that runs down the middle). The ramp is to the right, raised and lowered by the wire right down the middle of the picture. 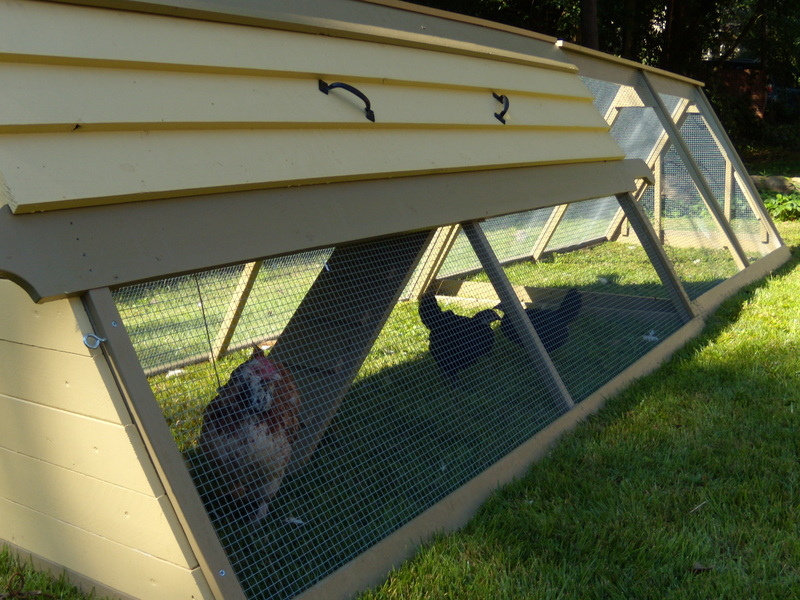 The chicken coop with ramp lowered. Victoria is the brown chicken and Margaret and Anne are the black ones. Haiku Heights is hosting The September Heights, a haiku-a-day challenge with a daily word prompt to be used as a theme and/or in the haiku. Today’s prompt is “sleep.” Click through to check out more haiku or to add your own. from bouncing in time’s white void. get home ahead of schedule. ship to get both back. Haiku Heights is hosting The September Heights, a haiku-a-day challenge with a daily word prompt to be used as a theme and/or in the haiku. Today’s prompt is “paradox.” Click through to check out more haiku or to add your own. Haiku Heights is hosting The September Heights, a haiku-a-day challenge with a daily word prompt to be used as a theme and/or in the haiku. Today’s prompt is “hummingbird.” Click through to check out more haiku or to add your own. Haiku Heights is hosting The September Heights, a haiku-a-day challenge with a daily word prompt to be used as a theme and/or in the haiku. Today’s prompt is “birth.” Click through to check out more haiku or to add your own. That being said, regardless of one’s religious inclinations, this is one of the most fun choral pieces to sing ever (soprano–I get to do those high notes at the end). And regardless of one’s opinion of the Mormon faith, the Mormon Tabernacle Choir does one of the best renditions ever. Haiku Heights is hosting The September Heights, a haiku-a-day challenge with a daily word prompt to be used as a theme and/or in the haiku. Today’s prompt is “glory.” Click through to check out more haiku or to add your own.